Browse EcoAdventures posts about history and archeology. 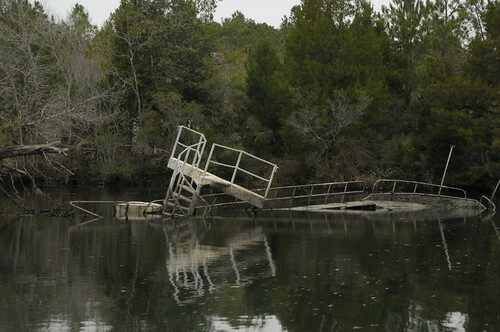 This wreckage is near the Higgins Landing Craft factory on the St. Marks River. On a St. Marks Charter tour, Captain James Nelson Hodges explains how the craft were used during WWII. North Florida is an area steeped in history and prehistory. St. Vincent Island is the home of thousands years old oyster middens, evidence that native people had made use of the coast for quite a long time. The first European settlers in North Florida were the Spanish, who introduced the wild hogs that still roam our forests. If you’ve ever wondered why so many places on our coast are named for saints, that was the work of Spanish friars (San Marcos de Apalache is now St. Marks, for instance). Natural resources drove American settlement here, from timber to commercial fishing and oyster harvesting.